Great War meditations soldiered on from that conflict's end to near a beginning of the Second World War. Best regarded of them was foxhole or trench-set The Big Parade and later All Quiet On The Western Front, neither shrinking from stance that war was hell. But what of grand show that also was battle? Richard Dix makes argument for it in Ace Of Aces, wherein his title character speaks to glory and quick reward (and quicker, cleaner death) claimed from air advantage. None of mud or limbs blown off for this eagle of the skies. Dix and brethren are about romance of war, and men just gaining majority in the early 30's must have come away from Ace Of Aces wondering if dogfights were not also fun fights for a generation who engaged them. So what if survival odds were against pilots? There was glamour to the pursuit --- goggles, fur collars, whipping scarves --- and best of all, compliant women during Paris leave. Aviation had claimed hearts of young men thanks to Lindbergh and barnstormers. How hard could it have been to climb up and shoot down Germans? Many, of course, would find out in ten more short years with WWII. Ace Of Aces came of Merian C. Cooper's exec tenure at RKO. It probably seemed like a keen idea after Warners did so well with The Dawn Patrol. The cycle for air action had been pedaled as well by Paramount with The Eagle and The Hawk, and follow-ups William Wellman did after Wings. But wait --- Ace Of Aces lost money, a negative cost of $277K not recovered by mere $265K domestic and $111K foreign rentals (prints, distribution, advertising needed more to ease overhead). Had aloft settings gone stale? There were but so many ways to show biplanes crashing, usually via miniatures (nicely done). Drama is Four Feathers inspired, Dix issued his by fiancé Elizabeth Allen, who calls moral objection to combat another name for yellow. Getting Ace job done in 76 minutes makes for fast hardening of RD to blood-lusting pilot, then as-rapid rehab to sane civilian for a finish changed at eleventh hour so his character wouldn't die after all. 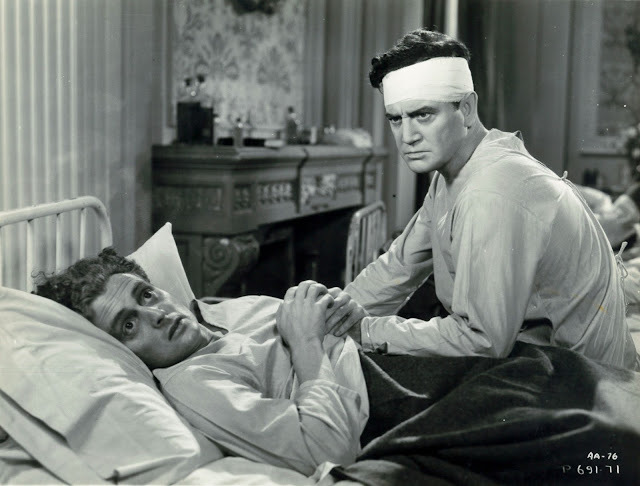 A mid-point romantic showdown between hardened Dix and humbled Allan sums up all that was finest about precode; if you've no other reason to watch Ace Of Aces, this portion will do. Dialogue throughout is near-knuckles and from knowing pen of John Monk Saunders, who'd felt war impact, even though he had not personally experienced combat. If you like Richard Dix (as I surely do), here is one of his signature parts. 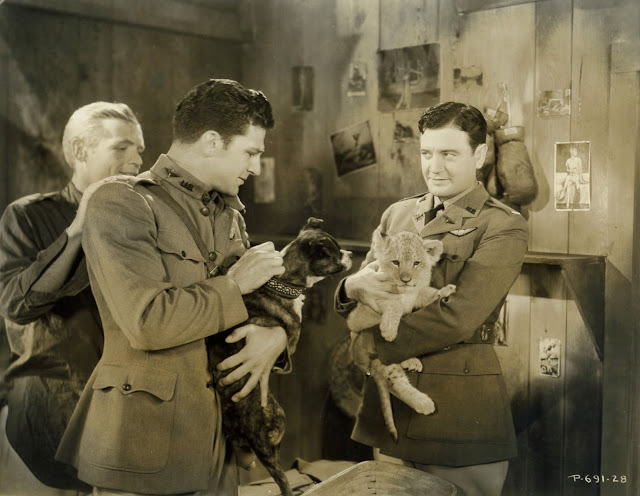 Runt of dog-fighting litter though it is, I've treasured Ace Of Aces from 16mm era, also vanished as biplanes, to recent DVD release from Warner Archive.